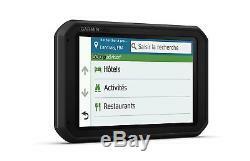 Garmin Dezl 780LMT-D Truck SatNav7 GPSBluetoothLifetime Europe Map & Traffic. 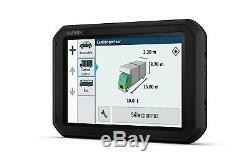 Garmin Dezl 780LMT-D Truck/Bus SatNav. Premium 7 truck satnav with powered magnetic mount and free lifetime map updates1 Custom truck routing2 for the size, load and weight of your truck plus alerts for upcoming bridge heights, sharp curves, steep gradients and more Includes free live traffic via Digital Traffic or Smartphone Link and Live Services with the free Smartphone Link app3 Easy Break Planning with timely notifications plus a Truck & Trailer Services directory, searchable by brand or amenity e. DKV or showers Control dzl 780 with your voice, and enjoy Bluetooth® hands-free calling4, smart notifications3 and built-in Wi-Fi® for easy map and software updates without a computer Dispatch and Track allows dispatchers to easily text messages and addresses to their drivers and even track drivers' routes from beginning to end For "Large Goods Vehicle" drivers who want a big-screen satnav to match, our dzl 780 LMT-D GPS truck satnav with its 7 touchscreen is the ideal road companion. In addition to its premium mapping, voice-controlled navigation and advanced connectivity features, it comes with a powered magnetic mount for secure attachment and easy removal when you exit the cab. Stay connected, alert and on track for the long haul with dzl 780 LMT-D To help you make the most of its high-resolution, pinch-to-zoom display, dzl 780 LMT-D comes preloaded with maps that also include truck-related route warnings such as bridge heights, sharp curves, steep grades and more for most major roads and highways. Just enter your vehicle profile information (customisable by height, weight, length, width and hazardous materials), and find truck-preferred routes suitable for the size, load and weight of your truck. Dzl 780 has detailed maps for Europe that include truck-related restrictions like bridge heights, dangerous curves, weight limits and more and related information for most major roads and motorways. Just enter your vehicle profile information (customisable by height, weight, length, width and hazardous materials) and find truck-preferred routes suitable for the size, load and weight of your vehicle. For added convenience, the Simple Truck Profile lets you easily swap trailer sizes with the touch of a button. Whats happening on the road ahead? Smartphone Link is a free mobile app that connects your dzl 780 with your iPhone® or Android smartphone. When paired, your dzl can access real-time information3 such as traffic, safety cameras, weather Information and more. The convenience of voice-activated navigation lets you control your dzl 780 LMT-D truck satnav with simple voice commands, so your hands can stay on the wheel while your eyes remain safely focused on the road. Built-in Wi-Fi keeps you up to date. Its easy to keep your maps and software up to date because dzl 780 features built-in Wi-Fi. When a new update is available and youre connected to a Wi-Fi network, youll automatically receive an on-screen notification. Then, you simply use the Wi-Fi on-screen button to update your data without needing to plug your dzl into a computer. Youll be ready to hit the road again in no time. Sync a Bluetooth-enabled smartphone or tablet to dzl 780 for wireless calling through its integrated microphone and speaker. You can also receive customisable smart notifications4 for calls, texts, app alerts and more, which appear right on your navigation display. To simplify life on the road, dzl 780 truck satnav provides easy break planning with timely notifications that help make the most of each stop. Locate points of interest that professional drivers care about such as food, fuel, rest areas, showers, ATMs, Wi-Fi and more. You can even search and filter truck stops by your preferred amenities, such as showers, fuel stations, Wi-Fi and truck wash. Dzl 780 also has an included Service History Log so you can record the dates and type of service performed. Conveniently keep track of tyre mileage, tyre pressure, oil changes, tyre changes and more. Your driver can select the address from within the text message and seamlessly route to the destination. 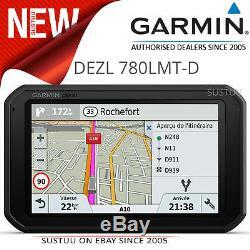 The dzl 780 truck satnav is compatible with the Garmin BC 35 wireless backup camera. When paired, dzl shows transmitted footage, right on its navigation display. In addition to its detailed mapping and big screen that can be easily seen across your cab, dzl 780 comes equipped with extra-powerful speakers that deliver spoken turn-by-turn directions you can hear loud and clear, even over road noise. An onboard Trip Planner lets you create multiple-stop routes and plan and save future trips. Theres also Easy Route Shaping, which lets you add a point on the map just by touching the screen, so you can adjust your route to include preferred roads, cities or locations. As you drive, Active Lane Guidance provides voice prompts and brightly coloured arrows on the display to indicate the proper lane needed for your next turn or exit. Full colour photoReal junction view displays realistic graphics of upcoming junctions to ease navigation through them. Plus, Birds Eye junction view offers a detailed view of motorway junctions, looking down as if from overhead. The dzl navigation screen also displays your current speed, the speed limit, the road or street youre driving on and your expected arrival time at your destination. Lifetime Maps Terms & Conditions. Not available in all areas. 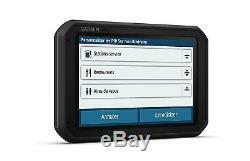 Garmin Real DirectionsT landmark guidance. Millions of Four square® points of interest. Trip Advisor® ratings for points of interest. Route shaping through preferred cities/streets. 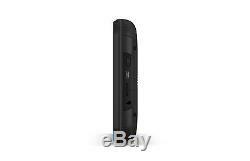 Voice-activated navigation (operate device with spoken commands). Lane assist with junction view (displays junction signs). Smart notifications via Smartphone Link app. Wi-Fi® map and software updates. Free live traffic and weather with Smartphone Link app. Driver alerts for sharp curves, school zones, red light and speedcamerawarnings, and more. Truck & Trailer Services directory. State&country border notices - Trucking. Free live traffic and weather forecasts when using the SmartphoneLink appon your smartphone. Up Ahead with road signs and trucker-friendly POIs along theroute. 19.9 x 12.2 x 2.4 cm. 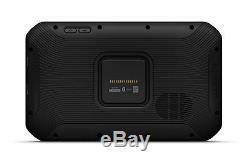 6.95 super wide view IPS, color TFT, with on-cell capacitive touchpanel. 15.2 x 8.9 cm; diagonal 17.7 cm. 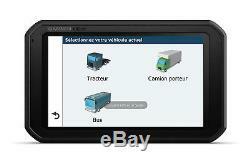 Preloaded CityNavigator® NT for Europe. Lifetime maps1 andlifetime digital traffic2 (indicated by "LMT-D"after model number on the box). Comes in GARMIN Retail Packaging so makes a Great Gift. This product has no reviews yet, however see what our buyers say about our other products.. We can deliver to anywhere in the World! We pride ourselves in delivering your item from the United Kingdom to as far as Australia in as little as 3 days depending on the service selected. Please Note that this excludes software, mapping and Hygiene products as these can only be exchanged if faulty. The Sustuu Store is a consumer electronics retail website dedicated to top brand-name manufacturers and specializes in the categories of GPS, home/office phones, personal care, pet products, and much more. Interested in becoming a vendor? We at Sustuu are always looking to expand our product line and build strong relationships with manufacturers and distribution partners. Or give us a ring anytime from 09:00 to 17:30 GMT, Monday - Friday, on 0203 0111 888. 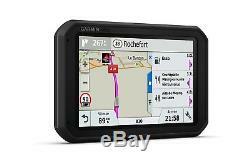 The item "Garmin Dezl 780LMT-D Truck SatNav7 GPSBluetoothLifetime Europe Map & Traffic" is in sale since Wednesday, June 6, 2018.